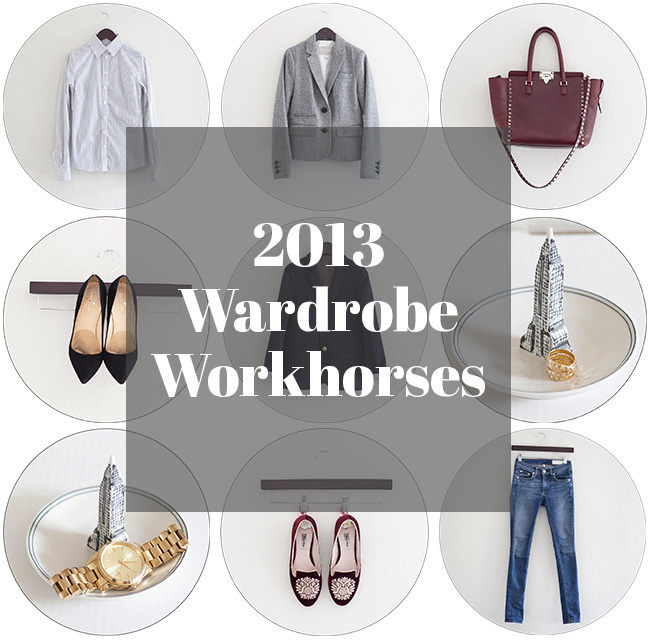 At the end of 2013, I recapped my best purchases and most worn items for the year. Looking back on my wardrobe and purchases in this way was a great critical thinking exercise in what purchases ended up most worth my money, and an examination into why these items ended up being so good for me. At the end of 2014, I tried to put together a similar round up, but I realized so many of my favorite items from 2013 were still sticking around. A post wouldn’t have been very interesting or enlightening for anyone to read, so I decided to skip last year. Since 2013, I’ve moved to a colder climate, added quite a few new purchases, and my wardrobe workhorses finally look a little different than they did a few years ago. I hope you enjoy this rundown of my current personal favorites, and maybe get some ideas about what may also make a smart purchase for your wardrobe in the coming year. 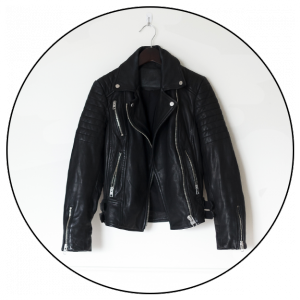 A classic that never goes of out style, a nice quality leather biker has been on my list for a while. When I found this cropped silhouette (for a normal fit on short ol’ me) from All Saints (a brand whose leathers I’ve often admired) in new size 00 and 20% off, I pounced and was pleasantly surprised by it’s petite-friendly fit. Since buying, it has been the perfect toasty topper for chilly nights and a gateway drug to my edgier outfit experiments. I look forward to seeing how the leather ages with time. You can see my fit review of this leather jacket here. As a menswear enthusiast, I have a deep love for loafers. 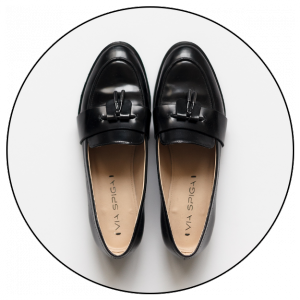 Unfortunately for me, at 4’11”, flattering flats are hard to find, with most looking bulky or visually dragging down my frame. When I found these sleek loafers, I knew I found “the ones”. I love the low profile of these, from the slim silhouette, non-chunky style, to the small tassel detail. I wear these really often, and loved them so much, I bought two colors. The black has been most versatile, but the burgundy has served as a nice pop of color when I want it. I’ve written before about why I love a collection of signature fine jewelry pieces. I’ve collected a few gold rings that I wear pretty much every day, but by far my favorite purchases have been my gold necklace set. All three pieces have been purchased separately, but when I started collecting, I already had an idea of what I wanted the finished look to be. I like the longer length chains because I feel they look a little more modern and edgy (the longest is 30”), and I also feel they help balance my short torso. 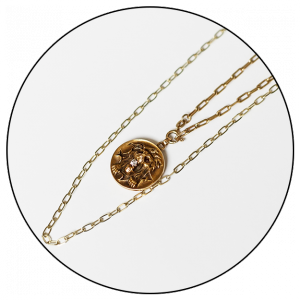 The pendant is a vintage locket with roaring lion, a symbol that has always resonated with me because 1) I’m a leo, and 2) as a shy introvert, I sometimes need a little king-of-the-jungle-esque nudge of courage in my day. I love pulling these over my head every day before heading out the door! I’ve found most of my vintage jewelry pieces on Etsy! As a shorty, I appreciate silhouettes that trick the eye into thinking I’m taller than I really am. Wearing cropped items on top have proven to be a handy way of doing just this. I’ve been amazed at how elongating this mix of deep-v neckline and cropped silhouette can make me look just a tad taller, and even make hard to wear items like slouchy denim a little more flattering. I’ve also found it a non-bulky way to add a little bit of interest to an otherwise plain outfit. Since the day this arrived, I’ve reached for it pretty much every day. I’ve found this embellished belt to be such a great finishing piece to an outfit that I feel underdressed without it. I love how the geometric hardware peeks from the pant line for a bit of interest, and especially love the edgy element it can add to dresses, coats, and blazers. 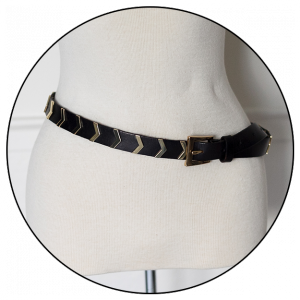 For my wardrobe palette and choice of jewelry metals, the black with gold hardware works for most cases, but I am on the hunt for a similar black with silver hardware. Similar at Linea Pelle & how gorgeous is this one at Otte? As a SoCal girl, I never really needed boots, but after moving to the San Francisco Bay Area, I realized a girl could not live on pumps and loafers alone. My feet were cold, the struggle was real, and these petite-friendly ankle boots saved the day. I like these for their small, narrow fit, reasonable heel for easy walking with just the right amount of lift, and dipped notch in front to help give presence to petite legs. Once I discovered how great these were, I picked them up in both black and grey and have been wearing them nonstop this fall/winter. Accessories in vibrant colors can be fun, but from a versatility standpoint, neutrals win every time. 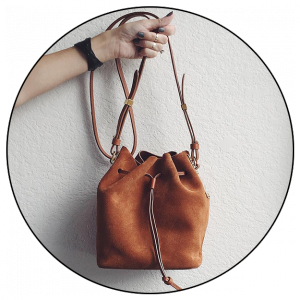 While this bucket bag’s lovely tan color is technically a neutral, I’ve found it serves as a pop of color against my wardrobe of mostly shades of grey. 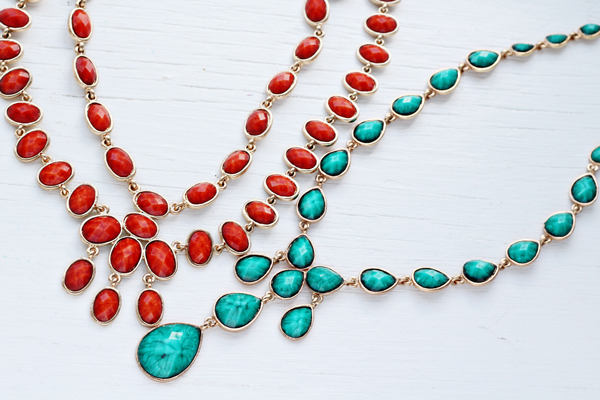 For this reason, it’s been an easy contrasting accessory to just throw on and go. Add to this the ease of a cross-body length strap and rich suede texture, and you’ve got a quick way to add interest to an outfit. It’s no secret I love a good button up dress shirt, and the classic white never goes out of style. However, I continue to find a white striped shirt even more versatile than it’s plain counterpart. 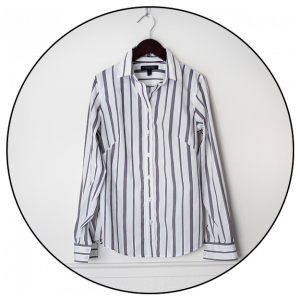 I love this bold striped version and find it can easily replace a plain white shirt while kicking an outfit up a notch. 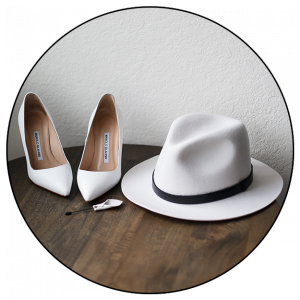 Ever since this white fedora and white pumps joined my wardrobe, I’ve really enjoyed wearing them as fashion bookends to round out an outfit. They also pop against my wardrobe of mostly dark colors, which has been great for a little variety. The white pin, when worn high on a lapel, visually rounds out an outfit similarly to the white fedora, and I switch them out depending on my mood or by what works better for a particular outfit (sometimes a hat is just too much). When not worn together, they also round out outfits by tying together items that have white stripes or graphics. 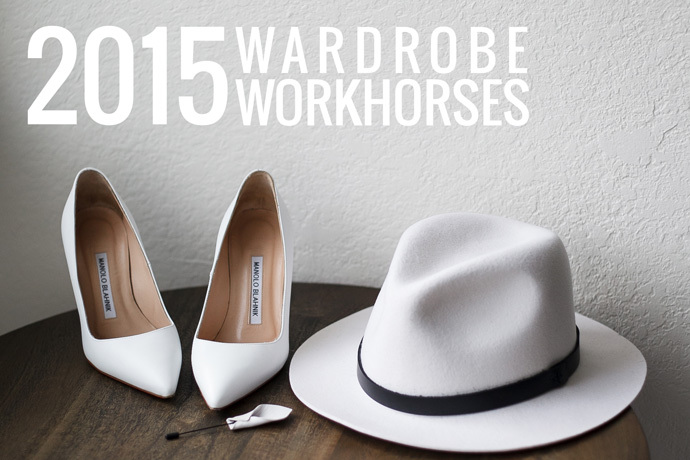 I’d love to hear what wardrobe workhorses you had in your closet last year. Were there any pieces that made you think, “thank goodness I picked this up!”? Share in the comments! Jeans. AG Stilt Jeans. My goodness it’s like wearing pyjamas. I can’t go back. I also found that I relied heavily on my poncho… Just to hang out around the house, even! .. Striped shirts too. PS…I got your email…still mulling it over. I’ll get back to you soon! My wardrobe workhorse is definitely my beloved Camper low heeled ankle boots. They are several seasons old and I have them in cool brown leather and black suede. The newest workhorse is a long, high-waisted ponte pencil skirt. Thanks for sharing, Yael! Good to hear your boots are several seasons old & still going strong! Have you had to resole them yet? Love the classic leather jacket! Such a great staple piece. 1. Leggings! It’s been a leggings kinda year for me. So comfy, cozy, and go with so many things. 2. I hesitated but finally purchased a lacy tunic. I’ve been layering it under shirts that are just a tad too short to wear with leggings. I love how it adds the length I need and adds some interest to the outfit too! Your vintage button pendant sounds so cool! I think a good crop top is indeed perfect for petites as it is so flattering! White accessories are awesome too as they can be very striking! Thanks for sharing! I definitely want to try out the Margot booties, but for now, I can not live without my Rachel Comey Mars booties- perfect for a short gal! Also, Citizens of Humanity Rocker crop are my favorite jeans, and perfect length for my 5″1′ height so that I do not need to get them hemmed! I really want to check out the CoH Rocker crop now!